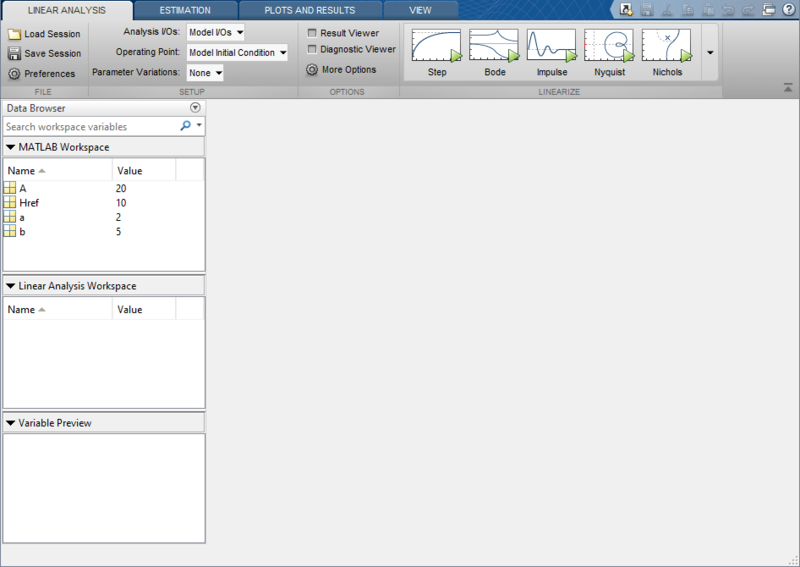 If you do not specify an operating point when linearizing a Simulink® model, the software uses the operating point specified in the model by default. The model operating point consists of the initial state and input signal values stored in the model. For information on linearizing models at different operating points, see Linearize at Trimmed Operating Point and Linearize at Simulation Snapshot. 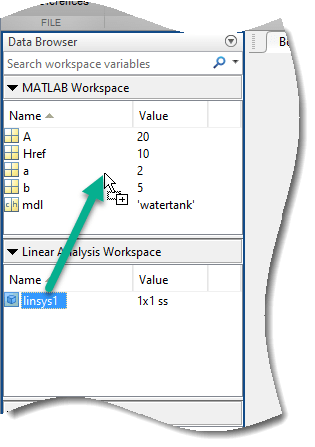 This example shows how to linearize a Simulink model at the operating point specified in the model using the Linear Analysis Tool. 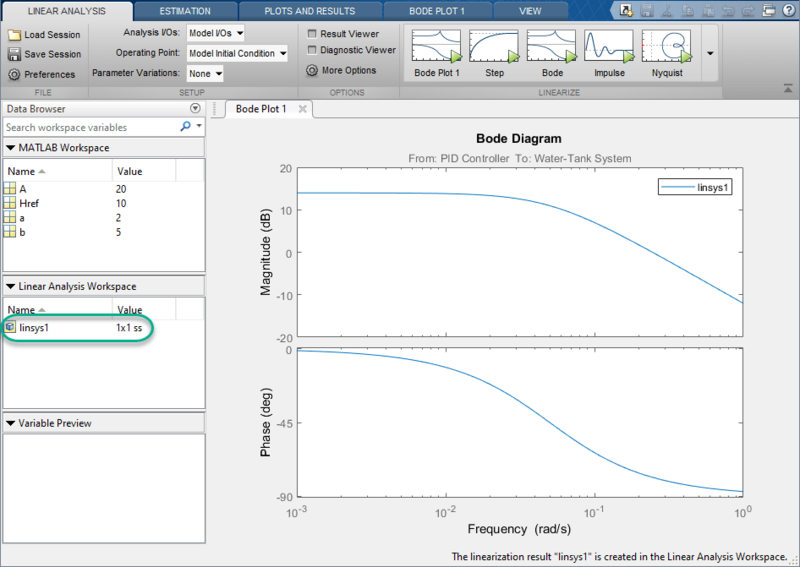 This example shows how to linearize a Simulink® model at the model operating point using the linearize command. For this system, the Water-Tank System block contains all the nonlinear dynamics. To specify the portion of the model to linearize, create an array of linearization I/O objects using the linio command. Create an input perturbation analysis point at the output of the PID Controller block. 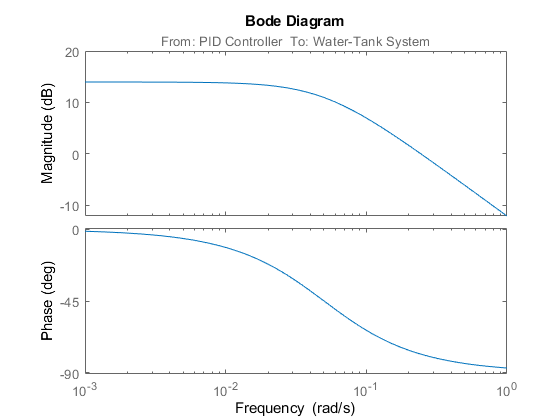 Create an open-loop output analysis point at the output of the Water-Tank System block. An open-loop output point is an output measurement followed by a loop opening, which removes the effects of the feedback signal on the linearization without changing the model operating point. For information on the different types of analysis points, see Specify Portion of Model to Linearize. Linearize the model at the model operating point using the specified analysis points. linsys1 is the linear model from the specified input to the specified output, computed at the default model operating point. You can then analyze the response of the linearized model. For example, plot its Bode response. For more information on analyzing linear models, see Linear Analysis (Control System Toolbox).